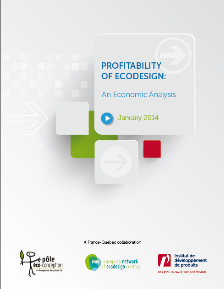 With the absence of studies on the economic and commercial impacts and benefits of ecodesign, and with the aim of filling the lack of management tools on economics and the environment, and in the context of providing the French and Canadian SME economic arguments, a study on the economic returns of the ecodesign was realized in 2008, It was a fruitful and enriching collaboration, between two partners: the Pole of Eco-conception and Management of Life Cycle of France and the Institute of Product Development of Canada. statistical results, and try to understand what makes a given ecodesign approach more profitable than another one. We work with the network of ENEC. would be. The main results of this new study are set out below. The preliminary diagnosis tool is in the form of a web platform including a resource center for eco-conception to the downtown relay method and tool. The preliminary diagnosis is distributed to resource centers to businesses whose purpose is the economic development of a region or a sector. It is a tool in the format of checklist based on the Pareto principle; it identifies eco-conception criteria that the company has not taken into account, has the potential for easiest improvement and probable first steps. The aim of the tool is to educate the group projects to the concepts of life cycle and offer them the realization of an eco-conception in a second time. Already transferred to more than fifty relay centers. The tool in its third upgrade is a multilingual platform. The Pole Eco-conception and Life Cycle Management trains a network of more of 52 relay centers through France, Belgium and Canada. Concretely, our association transfers methodologies like the ecodesign pre-diagnosis. The interest is to have a multiplying effect. To improve the support to the companies through the network of relay centers, we continue to develop and make studies and undertake research on our methodologies. BtoGreen aims to support companies to seize the opportunities offered by the new green economic deal. It’s based on sustainable development, and more specifically on the environment. The methodology helps companies build a new range of products and services making the environment their new source of competitive advantage through adding value and reducing environmental impacts. Provide SMEs with a personalized audit of their practices and their position in innovation, marketing and environment to define their environmental strategy (Eco-conception, eco-innovation or diversification). Search for new ideas, imagine innovative concepts according to the strategy defined. Support SMEs in the implementation of action plans to prioritize the ideas and convert them into innovative projects. To explain BtoGreen the framework, we made a serious game called BtoGreen the Experience. 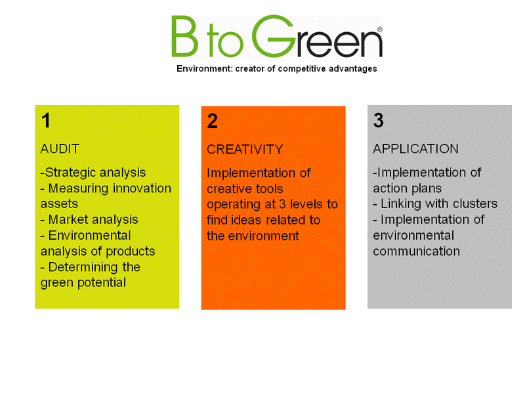 The BtoGreen Experience ® trains operational managers, business managers, technical managers, students, future engineers, technicians and marketers on innovation and eco-innovation. 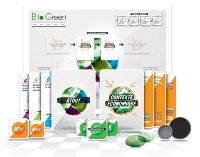 Experience BtoGreen is a compendium of eco-innovation. Players assume the role of responsible people in innovation. Competitors must achieve maximum revenue over 5 years by launching a new product every year. The Winner is the one that will adapt its strategy of eco-innovation in the demanding business environment of the company.